Typically, in making a speech at a public forum, businesspeople hope to get a return on their investment. After all, giving a great speech or serving on a panel before a targeted audience necessitates your valuable time and effort in preparation. You could give a speech and then go back to your office waiting for the phone to ring. 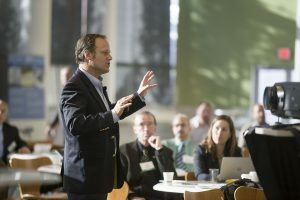 Or, you could give a talk and then take strategic steps so that you can further connect with the individuals sitting in the audience – for strong results. The latter point can lead to a strong ROI, if you effectively manage the crowd. A widely acclaimed Los Angeles consultant and valued friend of mine, Joey Tamer, knows the important details to manage the audience members – after she gives a talk or serves on a panel. Ms. Tamer made her stellar reputation as a strategic consultant to technology and media, and she’s been a frequent contributor to this business-coaching portal. In other words, she knows how to make people comfortable so that they will wait in line to talk with you. 1. Move away from the podium. If the room is needed for the next speaker, move into the hallway or the speakers lounge (if it is nearby) with your crowd. 2. If you can, set a stack of your business cards a full arm’s reach away from you on a table, so folks can pick one up if they don’t want to speak with you directly at this time, or cannot wait in line for the chance, or if they want to learn more before contacting you. 3. Keep more of your business cards in your left hand pocket. 4. Acknowledge the line of people waiting to speak with you, with a nod and a welcoming smile at the line. 5. Focus on the person in front of you. Offer direct eye contact and shake hands (with your right hand) while offering your business card with your left (from your left hand pocket). 6. Focus on the person’s name so you know it. Ask for their card. 7. If they hand you a laminated card (all the rage just now, but you cannot write on them), pull out a post-it (2 1/2 inch by 1 inch) from your pocket and write your notes on that. 8. You must take notes on the cards. You will not remember what each person said. Not even later tonight. And remembering will distract you from the next person in line. 9. Set aside high-maintenance talkers who disregard the others in line. Smile deeply at them, and say “Please, I want to attend to your questions in depth. Let me speak with these people who are waiting, and come back to you in a few minutes to speak in more detail.” If that person objects, ask them to phone you the next day (offer specific times you will be at your desk). If they phone, they are serious; if not, it won’t matter. “If you are wise, you will have offered your URL and email address during your introduction before speaking, so those who did not wait can still contact you,” says Ms. Tamer. “Allowing yourself to be accessible in these ways will smooth the way to expanding your network of colleagues, contacts, prospects, customers and clients,” she adds. Public speakers are admirably assertive people. But you have to do more than just give a speech in order to manage the crowd.